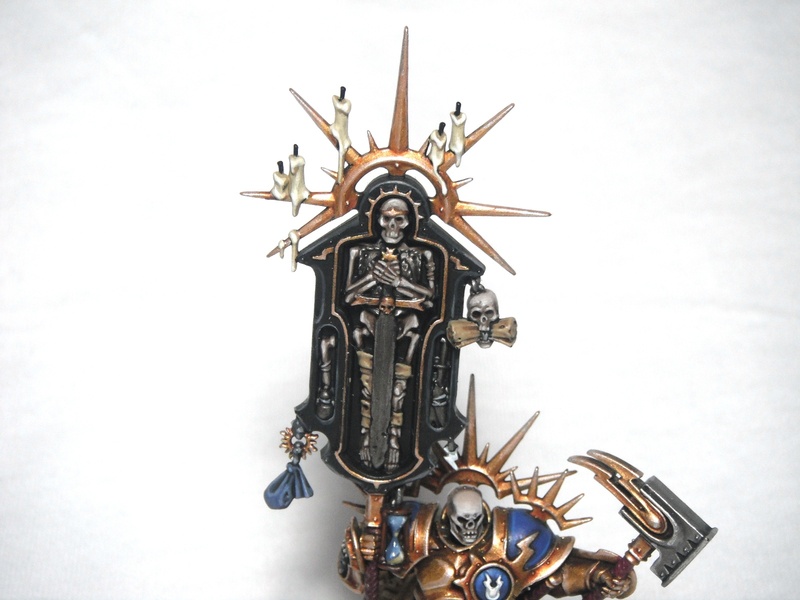 A lot of people on Twitter have asked me how I went about painting my Sigmarite Mausoleum and so I thought I would post the following quick guide. The colour scheme is based on the box art and follows the same basic colours as suggested on the box. The most important thing here is to paint smart and follow a set order of painting which will make painting a large amount of scenery quicker and more efficient. Spray the walls Mournfang brown. Apply a second coat of spray paint. This time more lightly using Incubi Darkness. The aim here is to leave some of the brown showing in the recesses. Wash the whole thing with Agrax Earthshade. Not only does this provide shading but it also helps to tie the two base colours together. Apply a heavy drybrush of Thunderhawk Blue (available as a Dry paint), gradually building up the colour. Pick out any skulls with Rakarth Flesh. Basecoat the ground Stormvermin Fur and pick out any rocks using Gorthor Brown and Mechanicus Standard Grey. Shade the skulls, ground and rocks using Agrax Earthshade. Lightly drybrush the whole model using Terminatus Stone. Now it’s time to pick out the details. I used Deathworld Forest for the plants, Balthasar Gold for the bronze areas, Retributor for the gold and Leadbelcher for the silver. Wash the plants with Athonian Camoshade and wash all of the other details Agrax Earthshade. And that’s it. I might go back and add more highlights, drybrush the plants green and pick out the roses but for now it’s more than ready for the tabletop. In my next post I’ll tackle painting verdigris. Last May I was very excited to participate in the series ‘A Tale of Four Warlords’ for White Dwarf. I loved the original series and was thrilled to be a part of the new incarnation and the relaunch of the monthly magazine. One thing I knew I wanted to do from the outset was create a visually distinct army and decided on the blue/grey scheme you see here. I have received overwhelmingly positive feedback on the army from people, many of whom recognised me in my day job at Warhammer World. I’d just like to thank everyone who took the time to comment on the army, either in person or online. Finally, I would like to thank my good friend and colleague, Louise Sugden, for taking the amazing photos you see here. 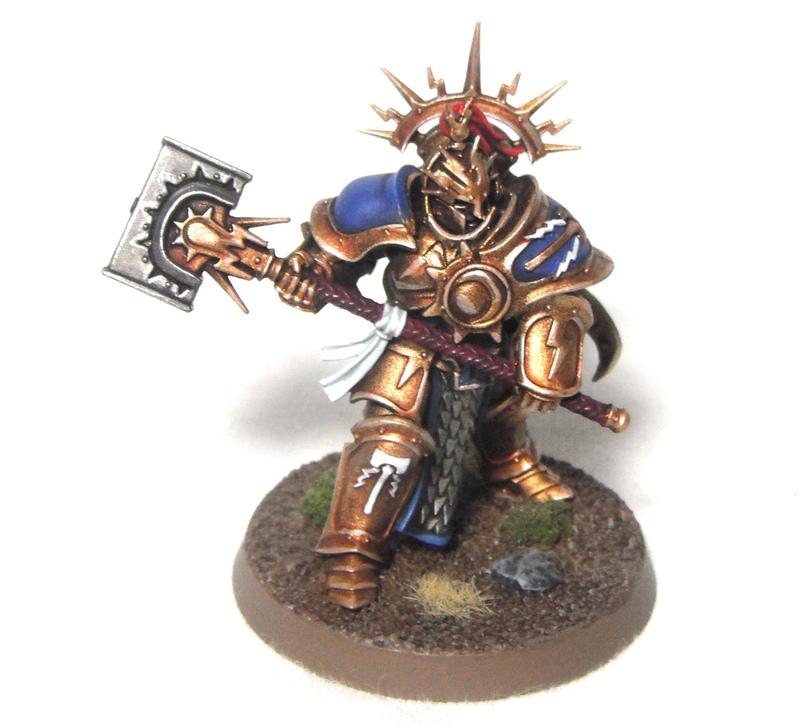 Following on from my first Blood Reaver, here is another test model for my Age of Sigmar Chaos force. I followed the same method as the Blood Reaver to keep the force consistent. I’m not 100% certain about how well the black armour works on Blood Warriors but I think this is the colour scheme I will go with. Initially I painted the face on the right arm gold like the trim but I didn’t really like the effect as it was a bit too ‘blinging’. A colleague, Stuart Edney, convince me to repaint it as daemonic flesh as though the armour is transforming and I really like the effect. It adds something a bit different to the armour and really makes the colour scheme pop. Below you can see the original paint job. I have also started to roll out the colour scheme to the rest of the models now that I am satisfied with it. I have had the Khorne half of my Storm of Chaos set in a box a while now and decided it was time to get it painted up. Here is my test model for my Blood Reavers. I decided to avoid the traditional red armour and used black instead. Overall I am pleased with the colour scheme and will use it for the rest of my Khornate force. 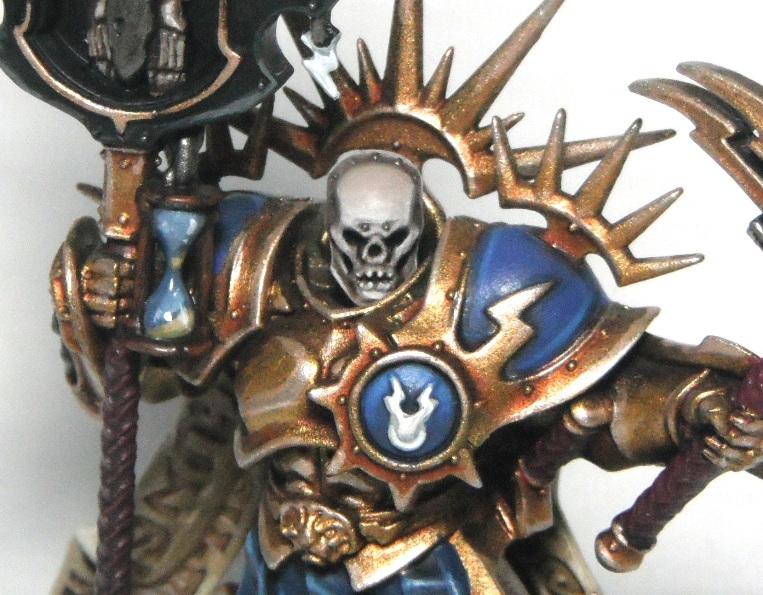 I just need to work on adding some non-Caucasian skin tones to the group to match the models in the AoS book. 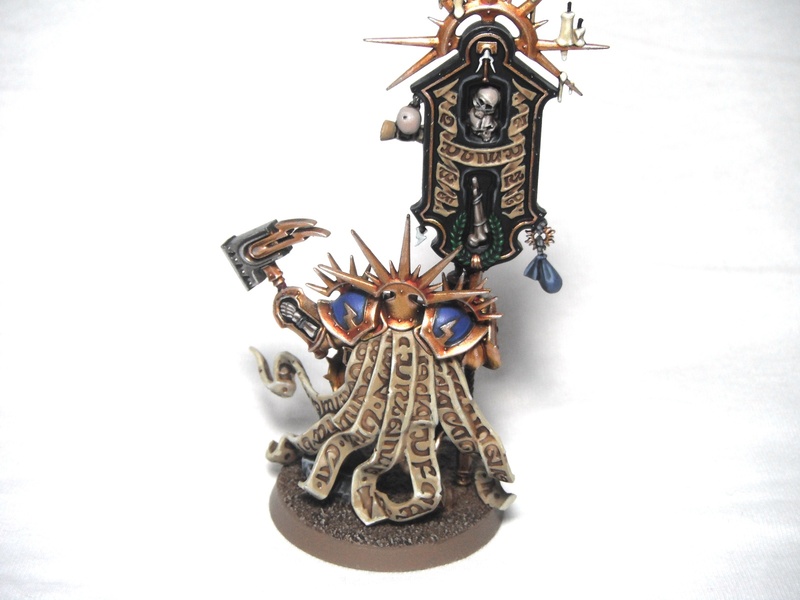 Another Age of Sigmar model complete, this time Lord Relictor Ionus Cryptborn. I really love the skull mask on this guy which was painted Baneblade Brown, shaded with Agrax Earthshade and then worked up through Baneblade Brown, Rakarth Flesh and Pallid Wych Flesh. 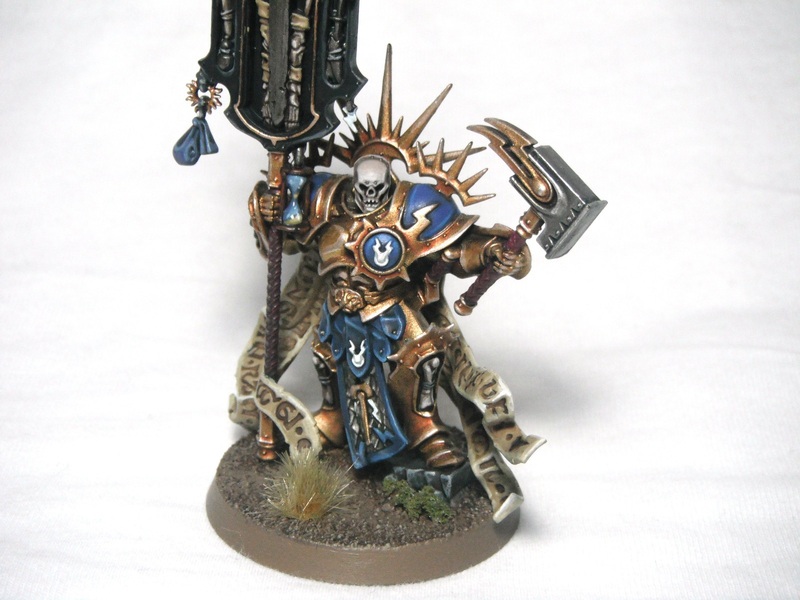 The rest of the model was painted the same way as my other Stormcast with an additional highlight of Mithril Silver on the armour and Vallejo’s Ivory on the parchments to make him stand out from the rank-and-file. Welcome back. 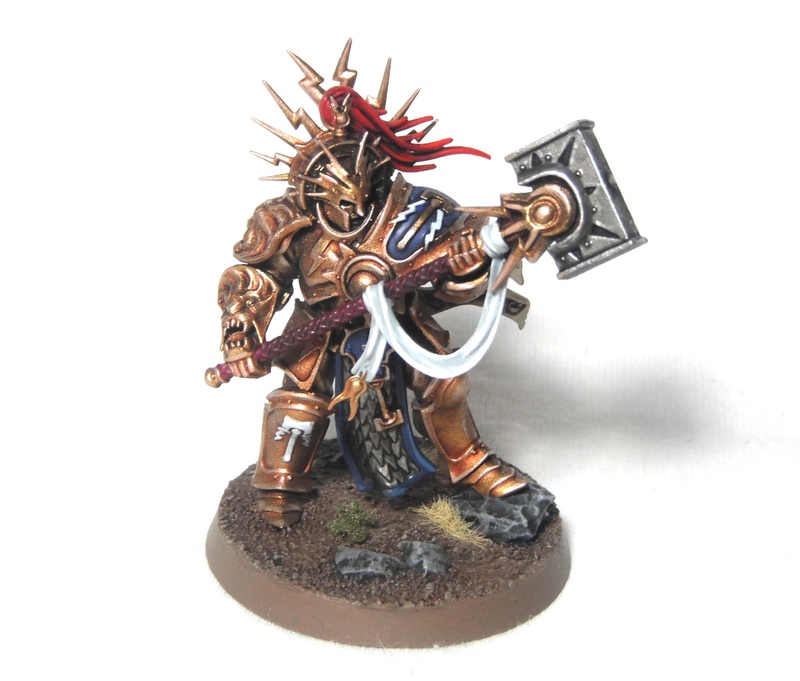 In my previous post I gave my initial impressions of Warhammer: Age of Sigmar from a painting and modelling perspective (spoiler alert: I love it). 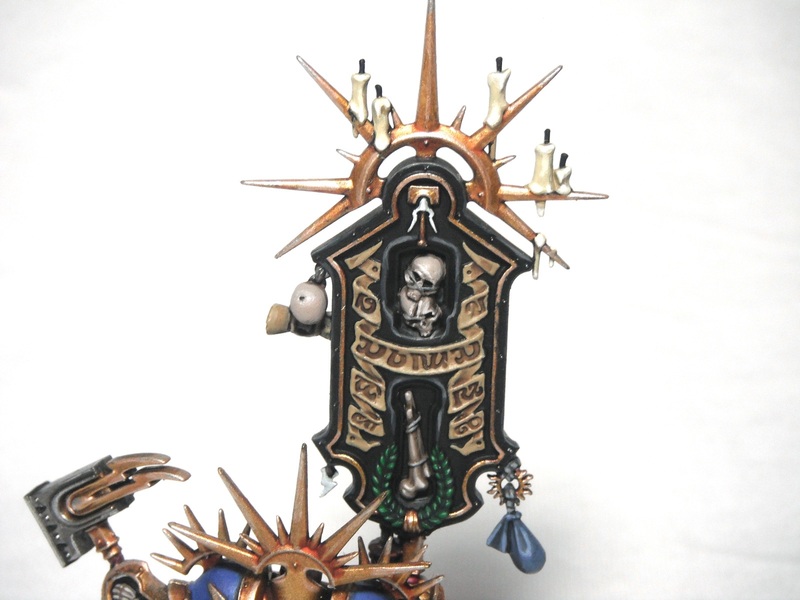 This post delves into the new background and rules that establish this exciting new age of Warhammer. 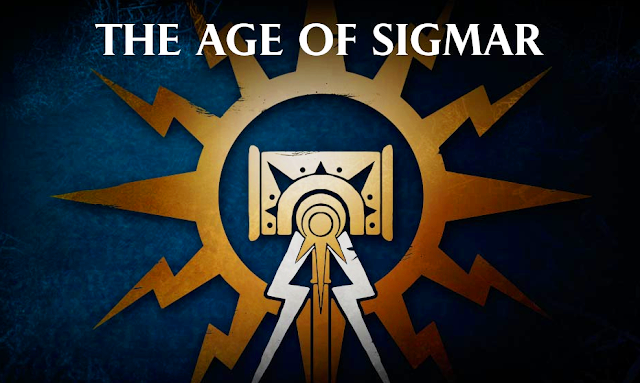 I should also give a mention to the guys at Tabled Podcast who provide an excellent account of the background to Age of Sigmar which you can listen to here. Their podcast is one of the things that got me so fired up about the game. As I said in yesterday’s post, I have been steeped in the lore of the Warhammer World for twenty years now and fondly remember pouring over maps of the Old World in the Warhammer Quest Roleplay book (the first Warhammer Fantasy game I purchased). For this reason I was genuinely sad to see the world destroyed in the End Times. However, the Warhammer World had become static. We all knew what it was and its history and the clock stopped some time around (or just before) the Storm of Chaos. In my opinion, the End Times series was a fitting send-off for the Warhammer World and again I must praise Games Workshop for having the bravery to destroy their setting so thoroughly. Part of me worried that it would turn out to be a marketing ploy like the death of Superman or Knightfall in the ’90s and that after a few months the Warhammer World would be magically restored somehow or that Karl Franz would wake up in the shower and it was all a dream. However, GW have shown no sign of this happening and are instead committed to developing the Mortal Realms. The new setting, with its diverse opportunities and mythic grandeur, has got me genuinely excited. We know that elves, men and dwarfs have survived but as yet have been told little of their history, territories or social organisation. Personally, I can’t wait for this to be revealed as GW develop their new setting. It finally feels like Warhammer is moving forward again. The Warhammer World still exists as a ‘historical’ setting for those people who wish to set their games in the ‘World That Was’ (this is even made explicit in the warscrolls on GW’s website). I couldn’t write a post about Age of Sigmar without mentioning GW’s new poster boys, the Stormcast Eternals. 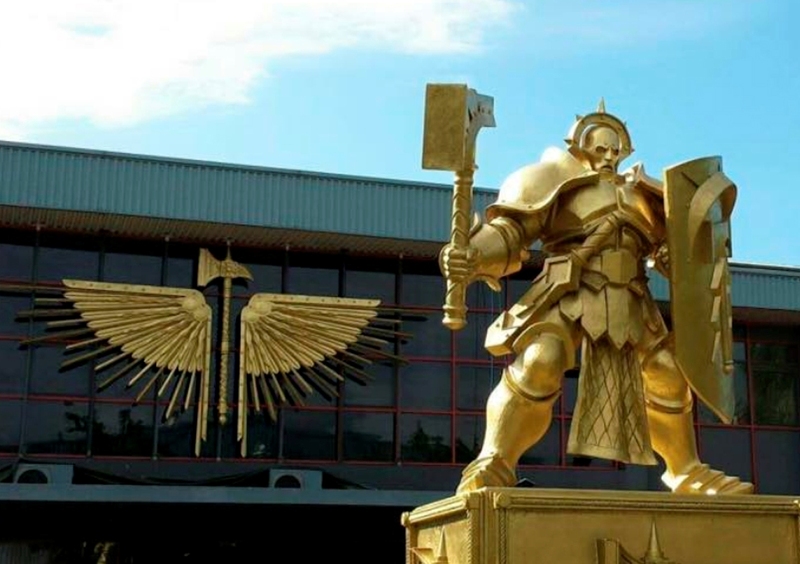 The company’s commitment to these new guardians of humanity is evident from the new statue at GW HQ shown above and these really are the protagonists of the new game. 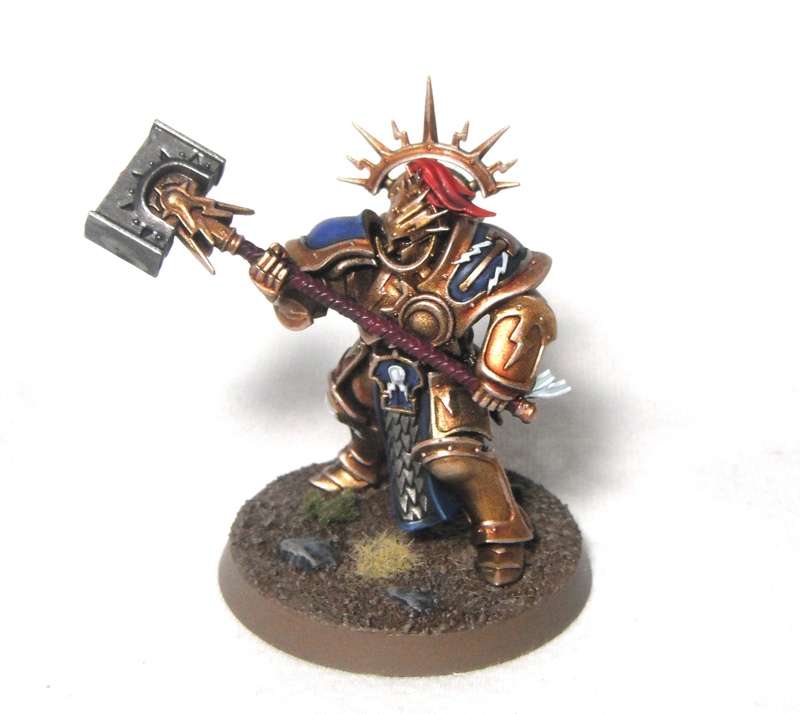 I really like the background and models for the Stormcast and am eager to learn more about them. The idea of super-human warriors taking the fight to Chaos really appeals to me. At first I was a bit ambivalent about the models but after painting up a few units I have really fallen in love with them. They are fun to paint and, importantly as my gateway army back into Fantasy, look great with a simple colour scheme that is quick to apply. This means I can have an army of them painted up and on the table in next to no time. Many people have compared them unfavourably to space marines and the moniker ‘Sigmarines’ is already a common pejorative term being used around the internet. However, I like the fact that 40k has started feeding back into Warhammer. Back in the days of Rogue Trader, many fantasy archetypes were ported over into a sci-fi setting and given lasguns and shuriken catapults. It’s nice to see this go in the opposite direction and for an element of warhammer 40,000 to be adapted to a fantasy setting. Undoubtedly one of the major draws of the game is the fact that all of the rules are free to download. No longer do you need a rulebook, expansions, army books etc to play the game, cutting down the cost of entry. As someone returning to Fantasy after many years I no longer have to worry about which rulebooks are still current or compatible with the latest edition. I can simply download the warscrolls for whatever models I have in my collection and get playing. Another common complaint. Again, as a painter and collector I really like the idea of not having to trawl through army books adding up the cost of units and picking out combinations of magic items. I know some people got a lot of pleasure from this, and it really is just a matter of personal preference, but as a casual gamer I am all in favour of it. So there we have it. I can honestly say as a casual gamer who is mainly interested in painting and modelling this release is perfect for me as it does away with a lot of the problems I had getting into Warhammer Fantasy Battle. I understand it may not be everyone’s cup of tea but I for one will be embracing this new age. 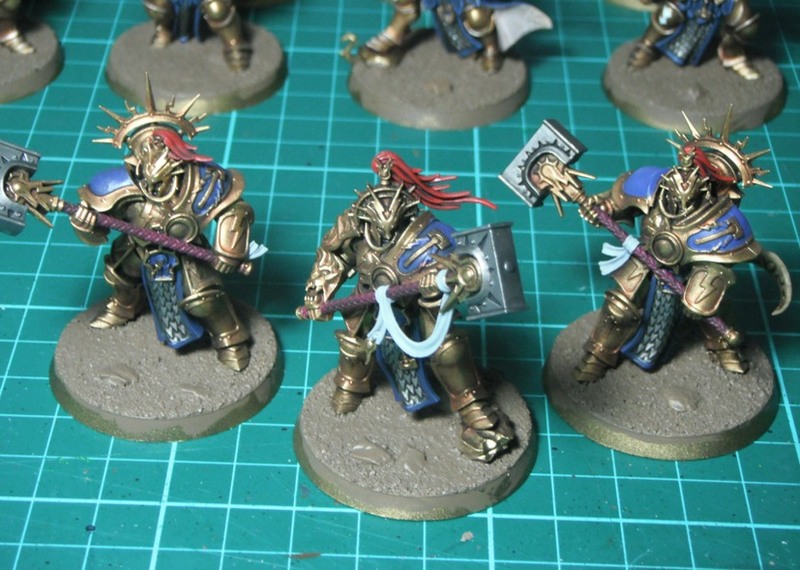 Next time I will share my painting progress on the Stormcast Eternals. See you then. 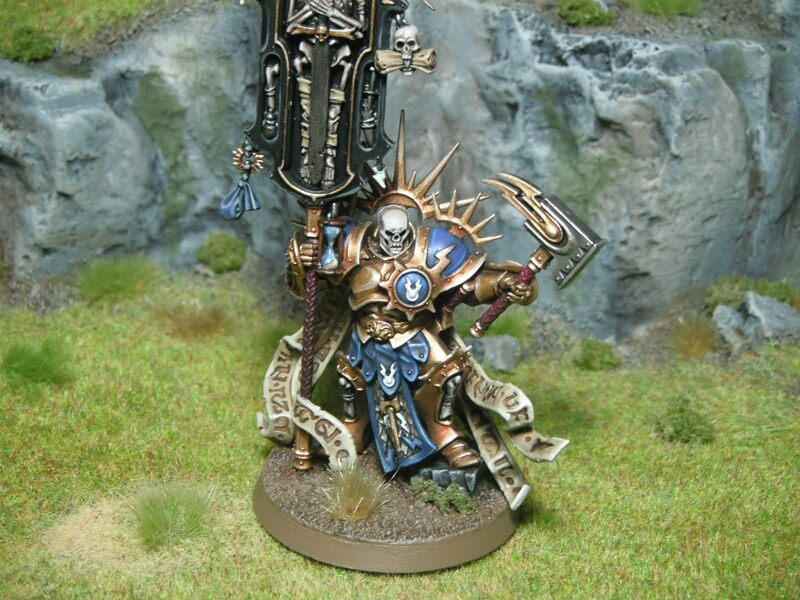 This blog post may seem a little late considering the fact that Warhammer: Age of Sigmar was released a month or so ago and the internet has been awash with these kinds of posts for some time now. However, there are two reasons for this. Firstly, I didn’t want to write an impulsive, reactionary response to the release, instead preferring to wait and see how it developed. Secondly, I was not initially excited about the game’s release but, as more and more information has come to light with each new release, I have become steadily more interested. I should begin by saying that, although I have been heavily steeped in the lore and history of the Warhammer World for twenty years now, I have not played a game of Warhammer Fantasy Battle or collected an army for it for a number of years. I have always liked the idea of having a Fantasy army, and have even made a few faltering starts over the years, but for some reason I have always found Warhammer 40,000 and the (now sadly departed) Specialist Games range more appealing. However, with Age of Sigmar I have finally taken the plunge back into Fantasy. Over the course of this and the next post I will try and articulate the reasons why. 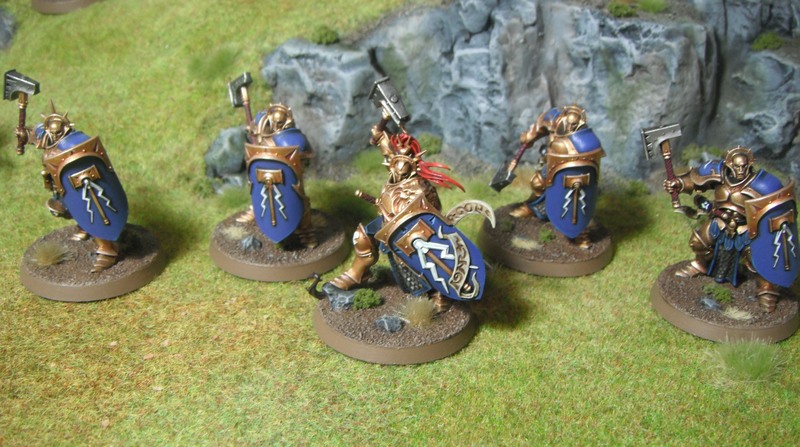 As a collector of 40k and Lord of the Rings I am obviously naturally drawn to smooth, inviting round bases rather than harsh, pointy square ones with their nasty angles and so the change to Fantasy on round bases was enough to draw me in. 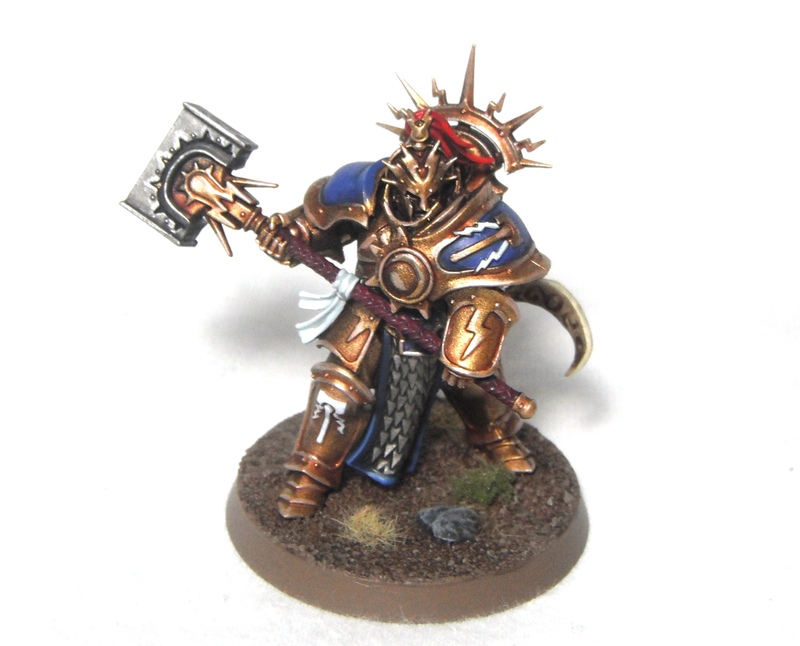 Joking aside though, as someone who is primarily a modeller and painter, I think the move to round bases has really helped shape my opinion of Age of Sigmar. Let me explain. I know this may be controversial, and many people may not agree with me, but Warhammer always felt to me like a game of pushing around large rectangles (albeit ones with lovingly painted Citadel miniatures on them). I always thought that other scales (such as 10mm as used in Warmaster) were better suited to this style of game. Another problem with square bases in my eyes is the constraints placed upon the miniature designers who have to consider how the models will rank up when assembled. While models may look great en masse when fully ranked up as a regiment, the individual models themselves tend to end up looking rather similar and lack dynamic poses. The Dark Elf range is a case in point: the new infantry models are well-designed and nicely sculpted but all rather mono-pose. The idea of painting up 20-30 virtually identical models to form a regiment is distinctly unappealing to me. At the opposite end of the scale are cool dynamically posed models that are a pain to rank up. Age of Sigmar does away with these problems. The seemingly superficial change to round bases and 40k-style unit cohesion frees up designers and hobbyists alike and allows for more varied poses and more dynamic models. While some of the old Warhammer fantasy Battle kits suffer for being on round bases due to their static posing, the new models sculpted with round bases in mind look fantastic. 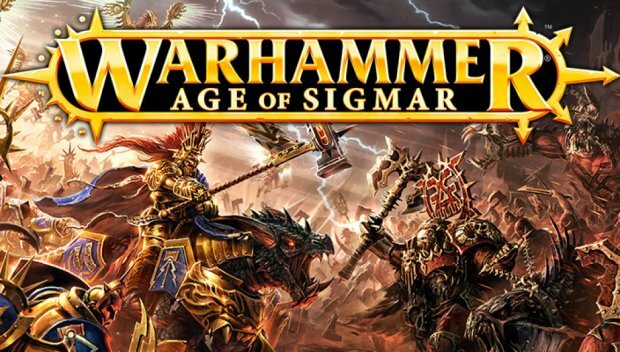 A chief complaint among those who dislike Age of Sigmar has been the lack of points costs, army lists or ‘balance’ (whatever that term might mean when applied to a game that revolves around randomness). For me, this is a sign that Games Workshop have been extremely brave with this release. For years now I have felt that many people have not been playing GW games in the spirit in which they were intended (as narrative-driven, story-telling games) but instead tried to force them into a competitive structure. GW have put their money where their mouth is on this one and done away with points all together. To me this feels like they are returning to their old roleplay roots and giving players a free pass to do what they want with their models. Furthermore, as someone who is primarily interested in painting and collecting rather than gaming, this lack of restrictions is a blessing. I always felt that having to take x number of these units as a minimum and y number of those units as a maximum was rather limiting. Now I can paint whatever I want and not have to worry about whether it is a ‘legal’ army or not. The fact that these restrictions have been lifted at an army level as well (allowing you to field units from more than one faction so long as they fall under the same broad allegiance) allows for even greater freedom and the opportunity to create some great narrative armies. I’m already thinking of adding some Dryads to my Stormcast Eternals as they battle through the Realm of Life or some human refugees made from the Empire militia set. The possibilities are endless. These are just a couple of things that have got me excited about Age of Sigmar from a modelling and painting perspective. Join me next time as I run through my thoughts on the new setting and the rules. 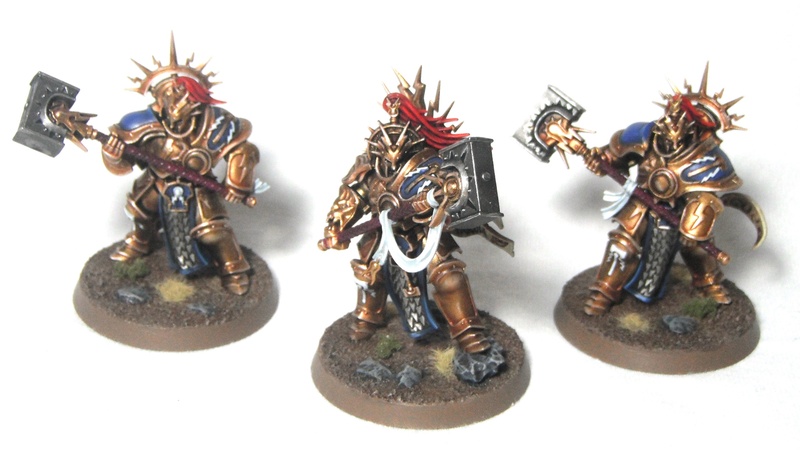 Following on from Friday’s post, here are my Stormcast liberators ready to bring Sigmar’s justice to the Mortal Realms. The models were fun to paint. 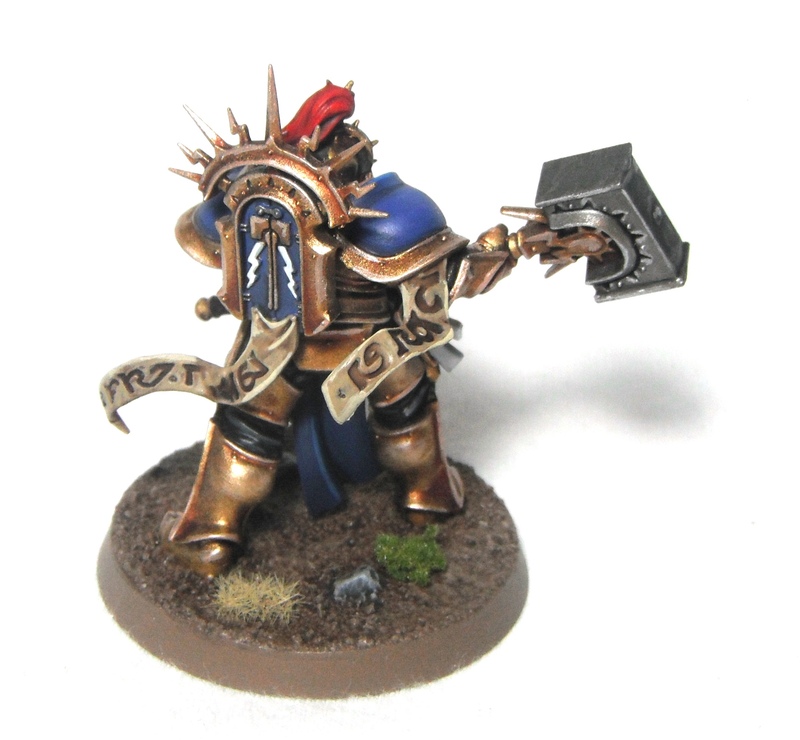 I used Games Workshop’s video guide which is a very quick and effective way to paint up Stormcast models, particularly when combined with Retributor Armour spray paint. Here is a photo of all of the completed Stormcast models so far. Most of the army from the starter set is complete now, I just need to finish the Prosecutors and the two characters. 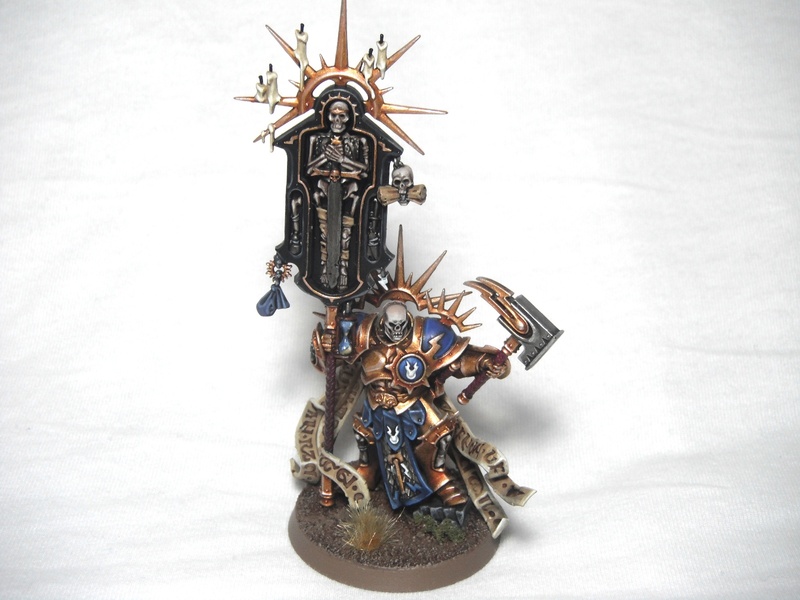 I am making good progress on my Stormcast Eternals and have completed the Retributors and the Liberators and nearly finished Ionus Cryptborn. I really feel like I have broken the back of this project and should have it finished soon. 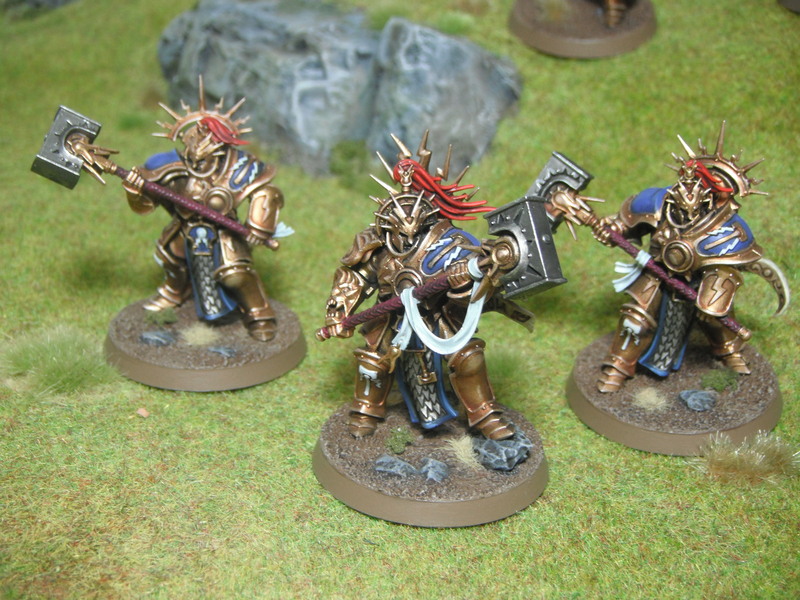 I must say, initially I was excited about the Khorne army in the starter set but I have really been enjoying painting these models; I may have to paint up some more Stormcast in the future. Anyway, here are some more pictures of my finished retributors. Work on the Stormcast Eternals continues. The base colours and shading on the Retributors are complete, just highlights to go now.